Ridgefield's Jack Christensen falls stretching for the puck while under pressure from Fairfield Prep's William D'Amore during their game at the Winter Garden Ice Arena in Ridgefield on Wednesday, Dec. 14, 2011. It was an opening-night battle between two of the top high school boys hockey teams in Connecticut, and one dominant period proved to be the difference. Defending Division I state champion Fairfield Prep, the top-ranked team in the New Haven Register's preseason poll, scored three goals in the second period and cruised from there in a 3-0 victory over No. 6 Ridgefield at the Winter Garden on Wednesday night. After a scoreless first period, Prep capitalized early in the second period and never looked back. Just 2:52 into the period, Conor Peterson deflected Sean Henry's shot from the blue line over Ridgefield goalie Nate Gliedman's shoulder to put the Jesuits on the board first. Less than three minutes later, Tom Worsfold banged home the rebound of a teammate's shot that had hit the post to make it 2-0. At 10:57, Henry scored on a breakaway to make it 3-0. After an evenly played first period, Prep held a noticeable advantage in the second and out-shot the Tigers 13-2. Trailing 3-0 in the third period, Ridgefield had several good scoring chances turned away by Fairfield Prep goalie Riley Wikman. With 4:50 remaining, Wikman made a nice glove save to thwart Ridgefield sniper Sean Wilkinson on a shorthanded breakaway. Both teams had scoring chances in the first period, but neither team cashed in thanks to some superb play by both goalies. The Jesuits killed off a two-man Ridgefield advantage for 1:12 with Matt Wikman and Sean Henry both serving minor penalties. The Jesuit trio of Worsfold, Matt Brophy and Billy D'Amore, followed by Andrew Hatton, A.J. Unker and Will Brophy, held the Tigers at bay during that two-man power play. 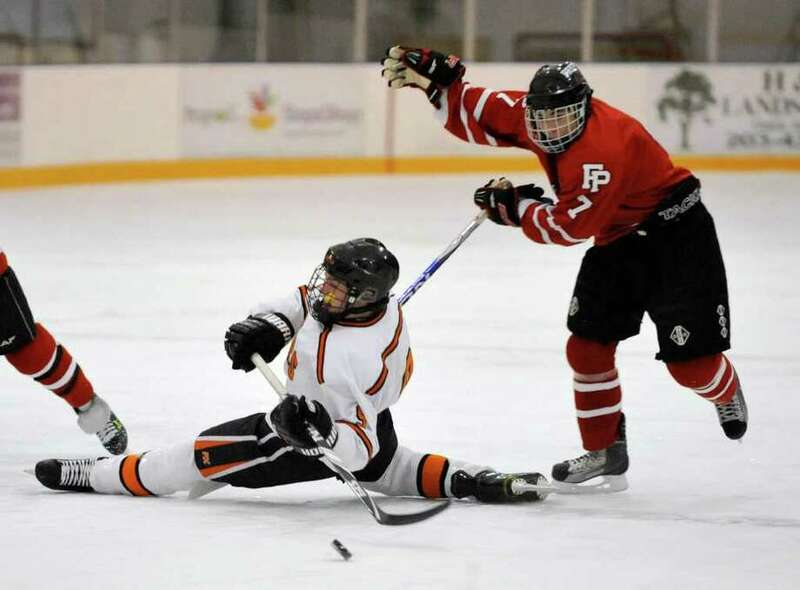 Gliedman stopped 35 shots for Ridgefield, while Wikman made 17 saves for Prep. Both teams have big games coming up on Saturday. Prep will host No. 5 South Windsor at the Wonderland of Ice in Bridgeport at 1 p.m., while Ridgefield will host No. 7 Glastonbury at the Winter Garden at 8:50 p.m.